The book was a page turner and the movie was charming, fun and dazzling. 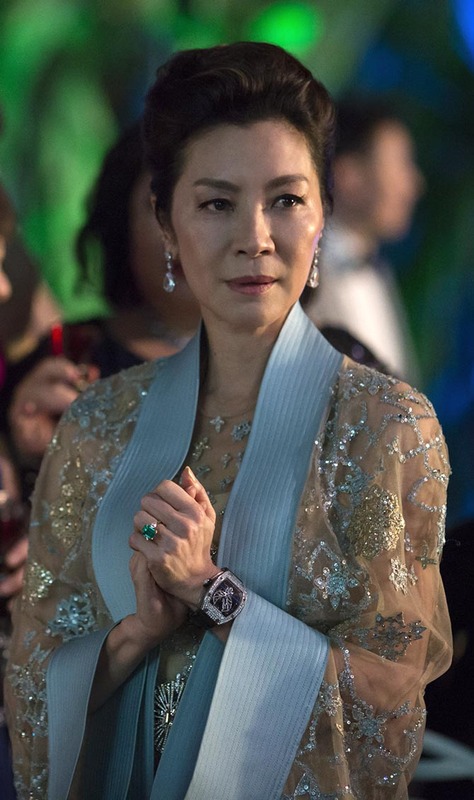 It was a ground breaking film for many reasons: an all Asian cast and it’s insane jewels and watches. Some of our favorite watch cameos were the Paul Newman Daytona Rolex and the Richard Mille Watch. The Paul Newman’s actual Daytona recently sold at auction for 17.8 million dollars. The one featured in the movie is not quite that valuable, but it is a true collectors item. Ah the jewels! We love when Astrid goes to her private jewelers and purchases pearl and gemstone earrings for $1.2 million dollars on a whim. Later the earrings become a symbol of independence and strength, so it is not all frivolous. Last but not least, we have to mention the Emerald and Diamond ring. Apparently this is part of the actress’s own personal collection and it is a stunner. It is great how the jewelry in this movie is not only dazzeling, but also is filled with symbolism and becomes a real player in the story line. This is a real jewelry lovers movie! Such fun. ← Ben Shemano Jewelry Wins J’s Reader’s Choice Again!